Litecoin’s upside is capped by $58.40. 1-hour SMAs create strong support zone. Litecoin is changing hands at $57.42, off the early Asian high reached at $58.39. The coin has gained 1.7% on a daily basis and 0.6% since the beginning of Monday. The market value of the seventh largest coin settled at $3.3B, the average daily trading value is registered at $194M. Litecoin shed $1.5 of its value in August amid global cryptocurrency sell-off. 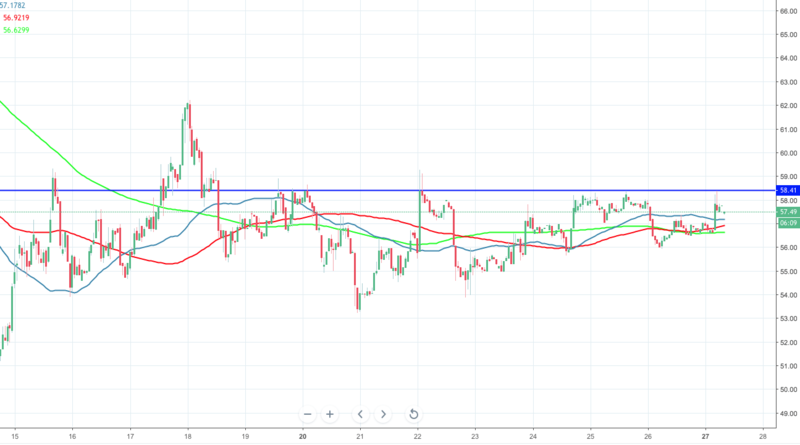 On the intraday level, LTC/USD managed to climb above all SMAs (1-hour chart), which creates a positive background for a short-term movement. However, the bulls need to clear $58.40 handle before they have a chance for an extended recovery towards psychological $60.00. The above-mentioned resistance has been limiting the upside since August 18. On the downside, the first support is created by SMA50 (1-hour chart) currently at $57.17, closely followed by SMA100 and SMA200 (1-hour chart) at $56.92 and $56.62 respectively. Once this area is cleared, the sell-off may be extended towards $56.00 and $55.92 (Sunday’s low).